Olive Oil For Treating Acne - How Does It Work? Olive Oil For Treating Acne – How Does It Work? Before we get into the treatment process of acne, let us first understand what they are and how these rather painful red swollen eruptions are formed. Olive oil is highly recommended for an oil-based remedy for acne because of its high vitamins and antioxidants contents. Acne is nothing but the outward manifestation that occurs in the pores of our skin due to it becoming blocked. This blockage is a result of excessive secretion by the sebaceous glands in our skin which draws a lot of dirt and other matter to it. Normally, the pores in our skin act as heat regulatory mechanism when our sebaceous glands secrete optimally, but sometimes due to a polluted environment; excessive stress; unhygienic lifestyle; imbalance in hormonal levels or even poor diet, could trigger an excessive secretion from these glands leading to the eruption of acne. There are chemically processed products that get rid of acne but there is always the chance of damaging your skin, so the next best thing is using an all natural alternative to get rid of your acne with something like olive oil. It is a natural antibacterial and has the ability to get rid of acne forming bacteria. The formation of scars is decreased by virtue of its anti-oxidative properties. 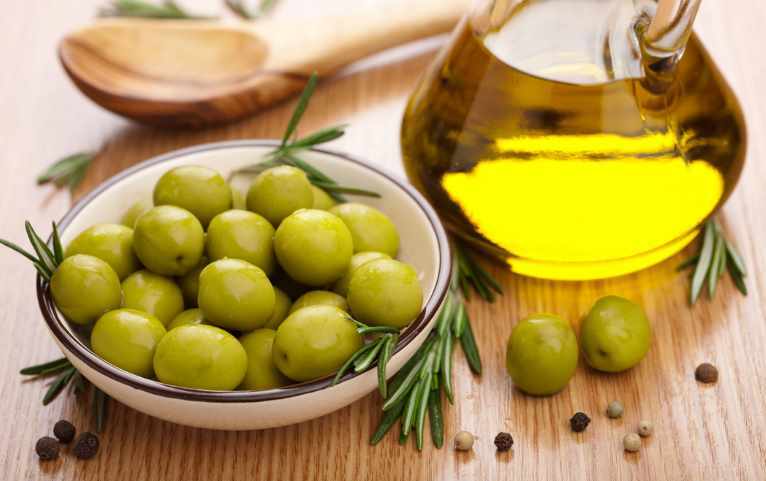 Polyphenols in olive oil helps to protect skin damage caused by free radicals. It helps in healing damaged skin due to its inherent nutrients. Olive oil cleanses the skin pores from dirt and other matter and brings about symptomatic relief. Besides beta carotenes and mono unsaturated fatty acids, the vitamin D, E and K content in olive oil helps the immune system to remain robust and infection free. Olive oil helps to maintain the skin’s oil balance thus preventing the formation of acne. We’ll now look at some of the ways you can use olive oil alone or in combination with other ingredients to remove acne. But before you start the application, cleaning the acne with a formulation designed for skin prone to acne, will go a long way in enhancing the effectiveness of olive oil in getting rid of acne. When you massage your skin with olive oil, the action not only helps in improving the blood circulation but also helps in getting rid of dirt and other matter from your skin. And because of its non-clogging nature, you can leave the application overnight. Procedure – Take some extra virgin olive oil and in circular motions massage the affected area and leave it overnight. The next morning, wash with a gentle cleansing solution and water. Repeat this procedure every night. For better results, take a soft cloth, soak it in hot water and after squeezing out the excess water, put it over the applied area till the cloth cools down to normal temperature and then remove it. The rationale of using sea salt in combination with olive oil is because of the exfoliating property of sea salt in getting rid of dirt and excessive oil from your skin and also in keeping the pH levels of your skin in balance. Procedure – Take one fourth to half cup of extra virgin oil and one cup of sea salt and mix thoroughly. Apply this mixture after you have washed your face and while your face is still wet. Massage the mixture in gentle circular motions for a couple of minutes and leave it for about five minutes, then rinse off with lukewarm water. Repeat procedure thrice in a week. The excess mixture can be used up to two to three days when properly stored in a fridge. A word of caution for people who have dry skin. After using this mixture, make sure you use a non-clogging skin moisturizer to keep the oil balance of your skin intact. If you decide to use this combination to get rid of acne, then you must understand that the acidic content of lemon juice not only has powerful caustic properties that cause the skin pores to shrink but also strong anti-oxidants that ward off free radicals that cause these eruptions. Procedure – Mix one quarter tea spoon of extra virgin olive oil with one eighth tea spoon of freshly squeezed lemon juice thoroughly and massage gently in circular motions on the skin. Leave the application for about five to ten minutes and then wash with water. Repeat the procedure everyday till your acne has disappeared. For more effectiveness, after rinsing off the application, massage the area with a little olive oil. The powerful penetrative property of rosehip oil and its ability to nourish the cells of the skin together with its potent property to fight inflammation and check the formation of scars makes it an ideal ingredient which when combined with olive oil has the effectiveness to get rid of your acne. Procedure – Take two tea spoons of olive oil and one tea spoon of rosehip oil and mix them thoroughly. Apply the mixture to the acne in a gentle circular massaging motion. Leave the application for about five minutes and then wash off with warm water. Repeat the procedure at least thrice daily. Baking soda, like sea salt, also has exfoliating properties that removes dirt from skin pores and helps in maintaining skin’s pH balance. Besides, it also lessens the swelling of pimples and shrinks it. Procedure – Take one table spoon of olive oil and one table spoon of baking soda and mix thoroughly. Wash your face and while still wet, apply the mixture by gently massaging it in circular motions for a couple of minutes. Leave the application for about twenty minutes and then wash off with water. Repeat the procedure every day. The inherent properties of castor oil to fight against bacteria and infection along with its anti-inflammatory and pain relieving properties helps to get rid of cystic acne, especially from areas around the face, chest and back. Procedure – Thoroughly mix equal quantity of extra virgin olive oil and castor oil and apply the mixture by massaging it in circular motions on the affected area. For better penetration of the mixture, place a wash cloth soaked in warm water over the applied area. Leave it on for some time and then remove the cloth and wash off with water. Repeat procedure every day. Steam is a natural exfoliating agent and when used along with a combination of olive oil and tea tree oil, it helps the ingredients to penetrate better and give results. Procedure – Take nine tea spoons of extra virgin olive oil and one tea spoon of tea tree oil and mix thoroughly. Wash your face and after drying off, apply the mixture in gentle circular motions on the affected area. For better absorption of the mixture into the skin, place a soft cloth, previously soaked in hot water, over the applied area and leave it for a couple of minutes. Wash off with water once the cloth loses its warmth. Repeat the procedure twice a day. The rationale of this combination is simple. Tea tree oil has the potency to fight against bacteria that cause acne, while honey not only exhibits anti-inflammatory properties but also moisturizes the skin. Procedure – Take a bowl and add one-fourth cup of extra virgin oil, half a cup of sugar, one table spoon of raw honey and ten drops of tea tree oil. Mix thoroughly till you get a smooth consistent paste. Apply the paste on to the affected area by massaging it gently in circular motions. Leave the paste on for five minutes. Wash off warm water and dry the area. Repeat the procedure regularly for optimum results. Garlic inherently contains compounds that fight against bacteria and reduces swelling and when combined with olive oil, it provides an effective method of getting rid of acne and also acne scars. This method can be used either orally or applied topically. Procedure 1 Oral Application – Take four cloves of garlic and after peeling and mincing them, blend into a smooth paste by adding four table spoons of extra virgin oil. Take one table spoon of this mixture and wash it down with eight ounces of water. Consume at least twice a day. Alternately, you could sauté one clove of garlic in two table spoons of olive oil, spread over a toast, sprinkle some cheese and pepper and have it regularly. The left over can be used up to three days. Procedure 2 Direct Topical Application – Take a few cloves of garlic, peel and mince them. Then add this to a pan with heated extra virgin olive oil and cook for about fifteen minutes. Strain out the oil and let it cool. Apply the garlic oil to the area affected in gentle circular motions before bed and leave it on throughout the night. Next morning, wash off with warm water and a mild cleansing agent. Repeat the procedure every day. Besides having potent properties that fight against bacteria and infection, apple cider vinegar also helps to maintain the skin’s pH balance. This when combined with olive oil, helps to get rid of acne. Procedure – Wash the acne affected area with water and dry off. Then mix one tea spoon of apple cider vinegar and four tea spoons of water and apply this mixture to the acne affected area with a cotton ball. After this dries, apply extra virgin oil to the affected area in gentle circular motions. Repeat this procedure once daily. Should there be any irritation, further dilute the apple cider vinegar. You could also add half tea spoon of lemon juice to the diluted ACV for better results. Lavender oil has inherent properties that not only cleanses skin pores and gets rid of acne but also revitalizes the skin. Procedure – Mix one table spoon of olive oil and about one to four drops of lavender oil. Gently massage this mixture on to the acne affected area till the mixture is completely absorbed into the skin. Repeat this procedure once daily. The leftover mixture can be stored in a proper place. Cystic acne can be effectively treated with a combination of salt, olive oil and lemon juice. Procedure – Take half tea spoon of extra virgin olive oil and mix it with one-fourth tea spoon of fleshly squeezed lemon juice and a bit of salt. Massage the acne affected area with this mixture and leave it for a couple of minutes and then wash off with water. Repeat procedure every day. Alternately, a mixture of olive oil and water can be directly applied to the affected area and left to dry and then washed off with water. This combination is effective is treating acne on the back because the inherent properties of clove oil show excellent pain reducing and infection fighting abilities. Procedure – Take ten tea spoons of olive oil and one tea spoon of clove oil and mix thoroughly and apply directly on to the affected area. Let it dry and then wash off with water. Repeat procedure twice or thrice weekly. Chemically, olive oil is quite similar to sebum and exhibits the same natural properties in keeping our skin healthy and supple. And using home-made soap made with it works wonders for the skin. Procedure – Boil a few pieces of ‘Melt & Pour’ soap base till properly melted. Remove from flame and add a couple of table spoons of olive oil and mix thoroughly. Pour into mould and let it set. Remove from mould once hardened and wrap with wax paper for storing it. Use this olive oil enriched soap daily for well nourished skin. Always use extra virgin olive oil. Steaming before application gives better results. Wash off olive oil application before going outside to avoid sun-burn. Use only recommended amount of olive oil to avoid aggravating the acne. Swishing a tablespoon of olive oil in your mouth without swallowing enhances acne treatment. Using olive oil in daily cooking also helps in acne treatment. Leading a healthy lifestyle with proper diet and exercise and drinking plenty of water will go a long way in effective acne treatment. But should you see no significant results even after four to six weeks of treatment, consulting a medical specialist is advisable.